No one wants to be ill on holiday, but it's reassuring to know that if you are you will be taken care of. In Ayia Napa there are several places you can go for sound medical advice. Sometimes a trip to the chemist may be enough as the pharmacist will be able to recommend something to treat minor ailments and illnesses. You may wish to visit a doctor or for serious cases a trip to the hospital may be required. Standards in health care in Ayia Napa and in Cyprus are very high with internationally trained professionals available to deal with any kind of medical situation. 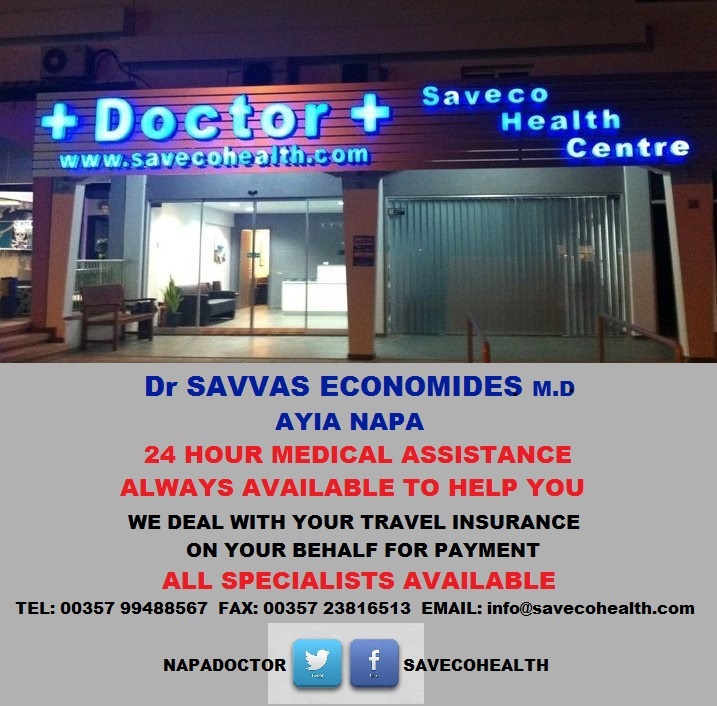 Saveco Health Centre is located in the centre of Ayia Napa, just off Nissi Avenue, by the Tsokkos Holidays Apartments. Find them just off Nissi Avenue in the heart of Ayia Napa. Behind Glint Clothes store and close to the Tsokkos Holidays Apartments. For tips and For advice on how to stay safe on holiday, please see Dr Savvas's general holiday health precautions. Established in 1993, Napa Olympic Private Hospital is the only healthcare Centre in Ayia Napa resort that offers the very best international practice in patient care and medical technology, Napa Olympic Private Hospital has been accredited by SGS U.K. Ltd. with the ISO 9001:2000. Napa Olympic Private Hospital offers its services to thousands of patients, both locals and tourists. It has an E.R. and Casualty department operating autonomously with a separate access to minimize the time for immediate treatment. Three fully equipped Ambulances are on call 24 hours a day and cover the complete radius of the resort. Find them in the Nissi Bay area behind the Florence apartments on Nissi Avenue and close to Pavlonapa and Sunwing hotels.